4.3 out of 5 based on 143 bloggers and 17 commenters. 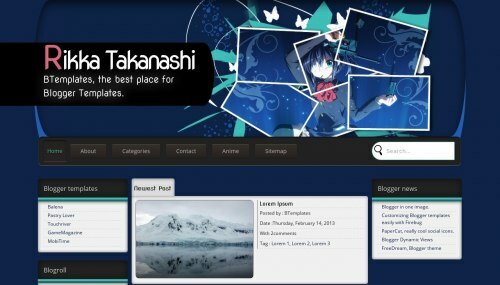 Rikka Takanashi is a free blogger template with 3 columns, left and right sidebars, gallery-styled, fresh look, rounded corners, an exclusive design for Blogger, footer columns, posts thumbnails, drop down menu, related posts support and vectorial elements. Excellent template for blogs about animals, anime or kids. Can I change the background ? numpan nanya gan, gimana cara ngatur navigasibar nya gan ? como eu faço pra instalar no wordpress ? gambar anime,nya bisa diganti apa tidak..? Nice template, i hope can make like this. Gan gimana cara ganti gambar rikha nya ? Can I change the background image at all? Been looking and can’t find the parameter. Can I change the background image at all? I have been looking and can’t find the parameter.